Israel blocked a flotilla of ships carrying 10,000 tons of aid and 800 activists and politicians on its way to Gaza by using military force and boarding ships in international waters. 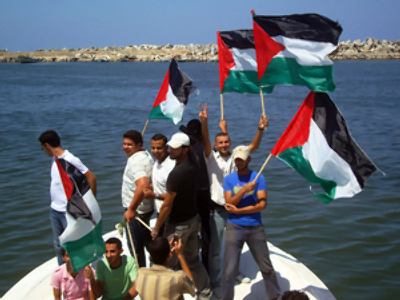 Israel continues to maintain that they reacted only after being provoked and threatened by those onboard the flotilla. The individuals onboard said they were attacked without cause by the Israeli military. Reports indicate that at least nine activists were killed and many other injured by Israeli naval forces. 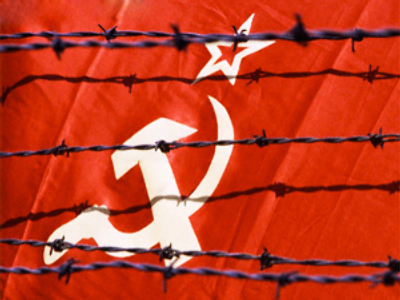 There is still much unknown of what actually occurred. 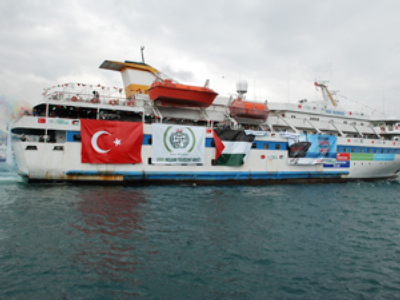 The Free Gaza Movement organized the aid flotilla with the hope of sending a message to the world that Israel has no right to starve 1.5 million Palestinians through by blockading the Gaza Strip. Norman Finkelstein, author of “A Farewell to Israel: The coming break-up of American Zionism” said “Israel is guilty of serious crimes” and that the blockade of Gaza is a “flagrant violation of international law”. Daniel Pollak, the co-director of government relations at the Zionist Organization of America disagrees. “The embargo and the inspection of goods that are destined for Gaza is perfectly legal,” said Pollak. He stated that Israel has a given legal right to defend itself and that the Hamas government in Gaza has continued to attack Israel and has called for the killing of all Jews. “Israel had no right to whatsoever to impede a humanitarian ship from trying to provide supplies to a population that’s facing, in the words of Amnesty International, a humanitarian crisis,” said Finkelstein. Debating the actions taken by Israeli forces, Finkelstein questioned why the naval commandos opted for a violent raid in the dark of night as opposed to disabling the ships or simply surrounding them at sea. “The ships were offered to unload their cargo at an Israeli port, Ashdod. If they had done so, there would have been no violence. Five out of the six ships did not offer resistance to the Israeli commandos who landed on them and there was no violence on those ships. We actually don’t actually have a need to investigate a great deal,” said Pollak. He continued, stating that the video evidence from the ships show that the Israeli forces came down “with paint guns on their back” and were greeted by “terrorists, who were a welcoming committee, beating them [Israeli soldiers] with knives, sticks, and knocking one Israeli soldier 20 feet down from one deck to the other. It was only after their lives were in danger that the Israeli soldiers reacted with violence.” Pollak argued that other options, such as disabling the ship, had the potential to be more dangerous to those onboard. “You say the video show clearly this and the video show clearly that. Whose videos? There were many people on that boat. Why were their camera equipment confiscated? Why were their videos confiscated? Why was their photographic evidence confiscated? What we have is the Israeli version of what happened. We don’t yet have the videos, but we might tomorrow. We don’t yet have the version or the video evidence from the passengers on the boat. If Israel has nothing to hide why did it seize all the photographic evidence of the passengers on the ship?” asked Finkelstein. Pollak responded, arguing that the videos were taken in order to prevent activists on the boat from doctoring the footage. One important and verifiable fact is that the event in question took place in international waters. Pollak said that the use of international waters is standard when enforcing a blockade and that the flotilla ships “refused to follow the legitimate directions” of the Israeli navy.